I keep seeing patterns of thought that I frankly think are pretty benighted. With luck, shedding some light on them will help. This one is so STUCK in darkness that I’ve decided to publish a little series on the subject. First is this editorial about patients in research. Next will be what happened when a researcher I know became a patient/family member. Then will be how this fits into a century-long timeline of progressing toward patient autonomy … which of course requires a matching increase in patient responsibility. 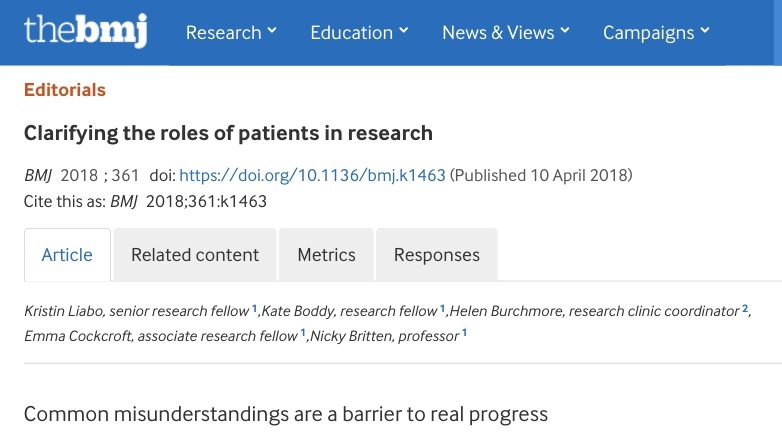 An editorial this week in the BMJ (a top medical journal) is titled Clarifying the roles of patients in research. It was brought to the attention of the journal’s patient advisory panel, on which I serve. The article pretty much says patients should be allowed to talk about designing a study, or be in the study, but not both. What?? The reasoning is a tortured sense of ethics, in which researchers are required to think about what’s right and fair to do toward others. Good! But it can get carried away: here we have someone deciding for us patients what would be fair and right – instead of asking us. This is pure paternal concern, which by definition assumes the cared-for person can’t be counted on to know what’s good for them. That may not be obvious, but stop and think about it. When a baby is new, we have to do everything for them, because they can’t. That’s good paternal caring. But there comes a time when the cared-for person gains the ability to handle more tasks, do more thinking, etc. And that’s not to mention the clashes when perspectives shift from passive to active. Even within the patient movement anger can erupt if one party says s/he wants to shift from “passive patient” to “empowered consumer” while another activist considers “consumer” to be a pawn of the industrial economy.